Cradle-to-Cradle (C2C) is a new, rewarding and very innovative concept used in more and more companies in Europe. C2C design is about creating continuous cycles of both biological and technical ‘nutrients’. This means that products are made from pure components that are easy to disassemble, in order to create new products in both the biological and technical cycles. Manufacturing processes rely on renewable energy, conserve water and embrace social responsibility (CSR). The quality management system of ISO 26.000 on social responsibility used in enterprises will be developed towards the needs of the VET schools and the new European quality system EQAVET. Therefore C2C fits in the European policy of achieving a Carbon Low Society and for New Skills for New Jobs. In The Netherlands and the partner countries UK, Germany, Romania and Greece there is much need to have C2C/CSR on vocational level, because (future) process operators, designers and middle managers also have to know about how to work and produce within the C2C ideas and concepts. Competence based education can fulfil these needs by using new educational methods developed in Germany. In the case of the Leonardo project it is about ‘serious gaming’. Serious gaming will be the anacrusis to training in the workplace and continuous learning. The end product will be a course and a train-the-trainer programme on C2C and CSR for corporate trainers and VET teachers. The trained trainers will participate in new and existing ‘C2C Training and Expertise Centres’, in which the link to enterprises and the demands of the labour market are highly strengthened. 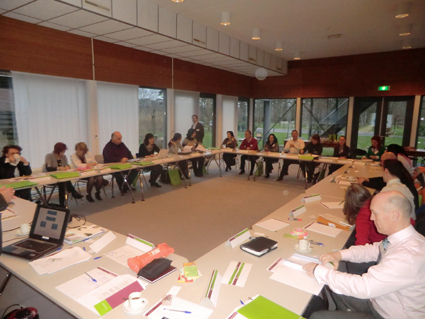 In januari 2012 we started a Leonardo project on Cradle to cradle. We try to make courses for teachers and industry to inform them what C2C is all about. from the Netherlands KPC Groep, Desso, Koning Willem I College, DSM e.a. Copyleft © 2018. All Rights Reserved.